Liberal ministers say world is becoming more dangerous for our health because of climate change, and that justifies more gov control over our lives and economy. Our kids are being systematically brainwashed in government schools and by government funded media. We need more than a few mild reforms if we want to save our way of life. Don’t buy climate change hysteria? You deserve prison! The Left’s vicious authoritarianism is quickly becoming the greatest threat to freedom and democracy. Everything they disagree with has become hate speech and thoughtcrime. Seems like nowadays most controversies in the news are about WORDS. Not policies or actions but what was said, not said, or how it was said. Left-wing puritans are trying to control speech so that only THEIR perspective becomes acceptable. Then they’ll impose their policies. That’s life in Ottawa under the #LibCons. Why does he keep looking down? Governments have been trying to buy votes and micro manage the economy for decades with tax credits, deductions, exceptions etc. As a result, our tax system is a costly mess. Of course, the Liberals will not withdraw Canada from the UN’s Global Compact for Migrations. 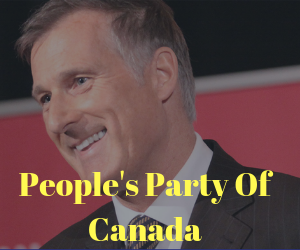 A @peoplespca government will. PrevPrevAsylum Shopping Says Ahmed Hussen and Who Wants To Talk About Court? Not Trudeau!